Last February in Paris, a really old dress sold for more than $150,000. 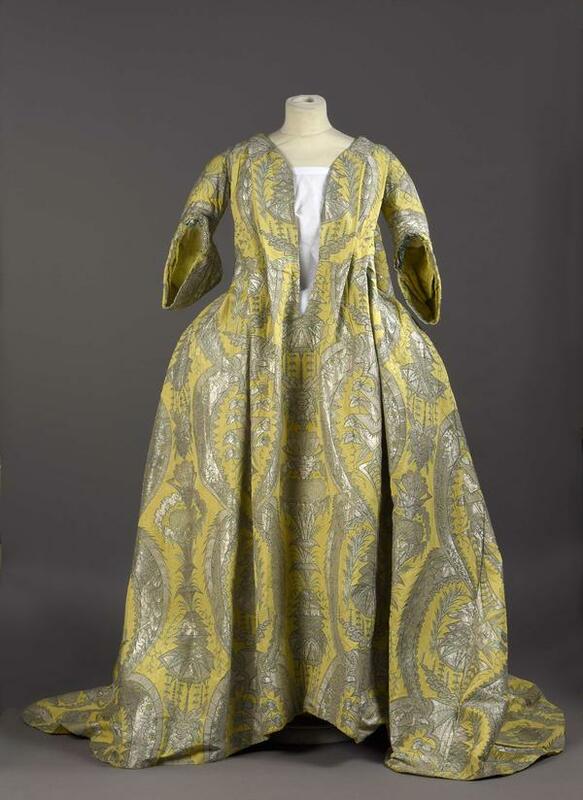 Granted, the dress might have been worn at Versailles, and it's in mint condition, considering it's been around since the 1720s or '30s. And it was part of a fashion revolution. Still, only museums or collectors of antique textiles would put out that kind of money. NPR special correspondent Susan Stamberg says a fashion museum did just that. SUSAN STAMBERG, BYLINE: This is the dress? This - there, covered with a sheet? We're in a big, empty storage room where the Palais Galliera, the fashion museum of the city of Paris, keeps its clothing archive. PASCALE GORGUET-BALLESTEROS: Yes, this is the dress. 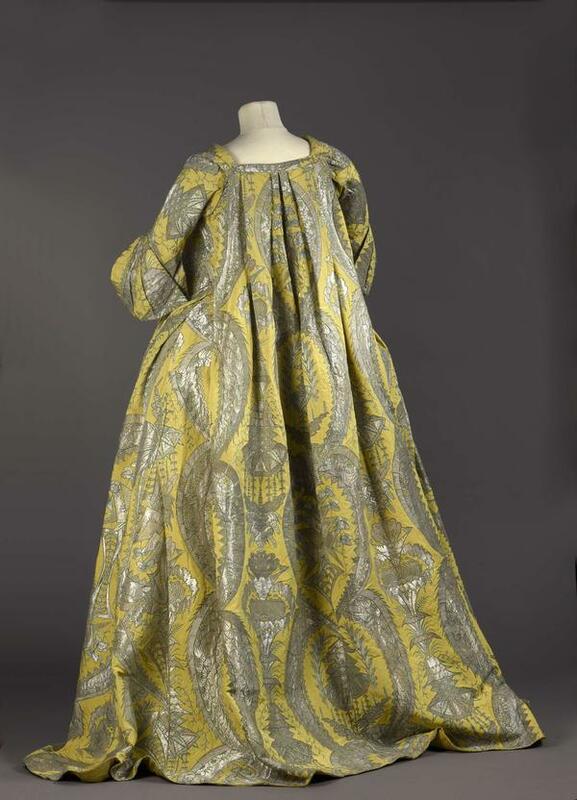 STAMBERG: Curator Pascale Gorguet-Ballesteros lifts the sheet off a mannequin to reveal a long, luscious yellow brocade gown - loose cut, patterned with silver thread, soft pleats in the rear, a deep V in front, graceful flowy sleeves. Tell you the truth, it looks like a million bucks. No wonder the museum wanted it. 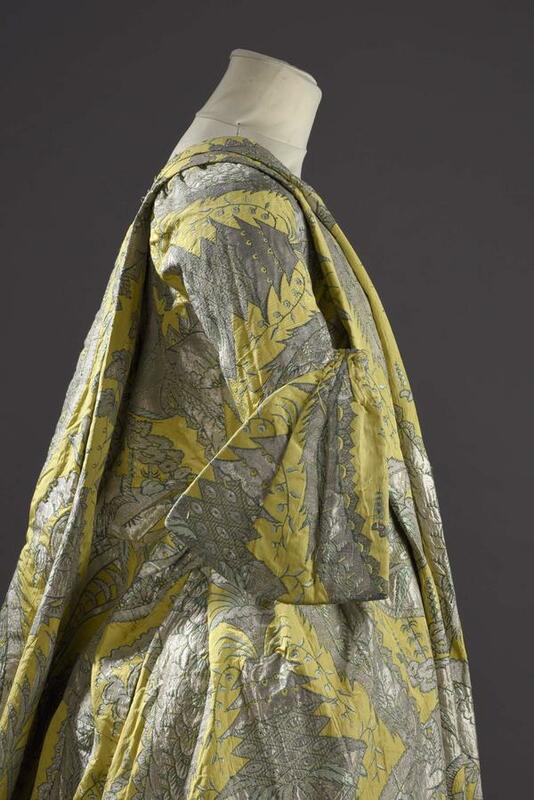 GORGUET-BALLESTEROS: The dress is interesting for the French history, for Versailles history and for fashion history. STAMBERG: The dress is called a robe volante - means flying dress. The shape is so full. An auction house in Lyon sent textile expert Raphael Maravelle Utan to Paris by train before the sale to show it to prospective clients. University of Pennsylvania historian Joan de Jean says Utan took care as he traveled. JOAN JEAN: He brought it in a specially designed suitcase. STAMBERG: En route, a bid arrived by text for over a hundred thousand euros more than he expected. Raphael held the suitcase closer, made his rounds in Paris and went back to Lyon. STAMBERG: Joan de Jean, author of "The Age Of Comfort," says, you had to dress in a certain way in Louis XIV's court. DE JEAN: You want to look formal. You want to look rich. You want to look powerful. You want to look impressive. That's what a court's about. STAMBERG: For women, that meant luxurious fabric, stiff, tight bodices, little waistlines. They were caged in, their bodies rigid. Courtiers had to be as formal and magnificent as possible. DE JEAN: Court dress was obligatory. His idea was to have a look of the French court. But they were to look all the same, all formal, for when his court was gathered around him, there would be this uniform style. STAMBERG: In Louis XIV's court, stylish women stood around a lot. All the bindings made it too hard to sit. At the end of that century, the formality begins to wear thin as it were. Magnificence becomes a burden. DE JEAN: No one in France wants to get dressed up anymore. Everyone just wants to be comfortable. STAMBERG: And so what Joan de Jean calls the greatest fashion revolution of all time is launched. The revolutionaries were young women of the court, merchants and dressmakers. Down with the corsets and cages. Up with the robe volante - full and comfy, in fancy fabrics or simple cottons. Everyone could wear it, and they did. The robe becomes a social leveler. DE JEAN: There were even foreign visitors to Paris who say it's an amazing thing in this city. You can't tell who is who. STAMBERG: Women could move differently. They could sit and lounge, cross their legs, even show a bit of leg. Painters started fixating on ankles and shins. DE JEAN: The leg as an object of desire. The leg as an erogenous zone. STAMBERG: All this from a new style of clothing. That gorgeous, expensive example is at the Palais Galliera in Paris right now. And there, textile specialist Marie-Noelle Sudre says it stands as a beacon of change and progress. MARIE-NOELLE SUDRE: It's like a sun, this dress. STAMBERG: Like looking at the sun. SUDRE: When you cross the museum and you see something like the sun. STAMBERG: It's really that special, huh?